25-30MM_S5349_FA5551_LASRP Genuine Italian Calfskin Lined with Soft Glove Leather. 1 1/8 inches tapered to 1" wide. Sizes Available from 32" thru 52". 4-pc Antiqued Silver Plated Buckle Set and 5 Open Mouth Sea Bass Conchos. 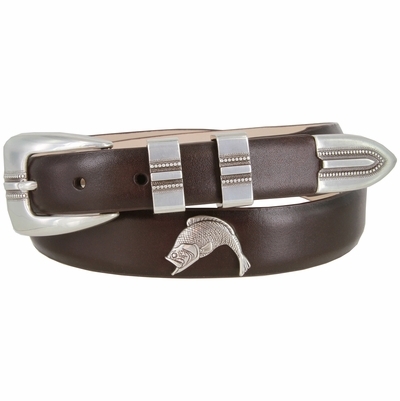 Leather Golf Belt also comes with snaps for Easy Buckle Change.